I turned 36. OK that is not much of an accomplishment, it’s like saying Oh hey good news, you’re still alive! 36 came and went, no big soiree or anything. More than 100 facebook posts and a couple of emails, but very low key. In all honesty I’m good with that because there in no cause for excitement and no need for special treatment. We all get older every day and the difference between 35 years and 364 days in no different than 36! I played a lot of hockey! I like playing hockey. It is one of the toughest sports I have had to learn. The balance of power, skill and finesse that you need to perform well on the ice is hard to achieve. I’m playing with people who have been playing this game their whole life where as I received my first pair of hockey skates for my 30th birthday! So up here I am something like 25 years behind on skills! So I try to overcome this with intelligence and athleticism. Honestly, the skills win most of the time, but I can hold my own out there! Speaking of hockey I also attended a Montreal Canadiens Game! Great seats and they finally got a win with a lot of offense on home ice. 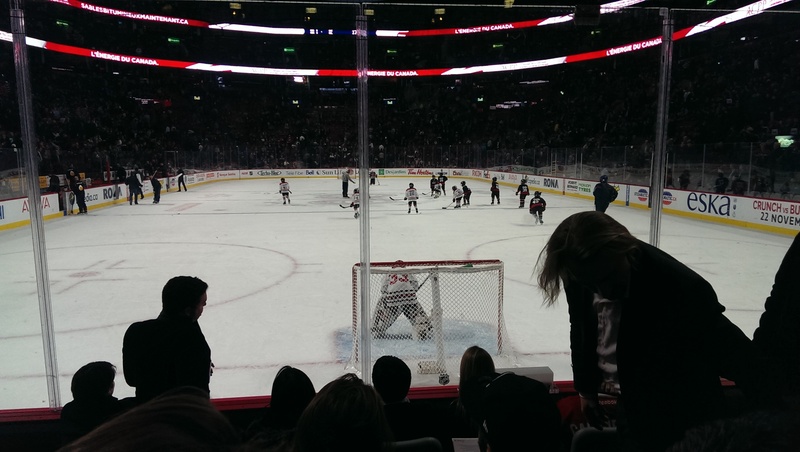 My friends son actually got to play in the Timbits game during the first intermission and my wife managed to score us some seats behind the goal! Below is a shot of the little guy in action, although he didn’t see much action at all. As it typically happens in these Timbits games all of the action tends to happen on one side of the ice so Zack didn’t receive any shots against. Still at 8 years old to actually get a chance to skate and play on the Bell Center ice is something really cool! I ate fast food for the first time in months! After the game my wife and I were starving. Both of us had a crazy day that day and neither of us ate dinner. If you think I was going to pay $15 for a hotdog some chips and a soda at the game you must be out of your mind! Instead we went to Harvey’s. For those of you who have never been to Canada this is a fast food/burger joint where you can get your burger made to order. I got a double burger with bacon and poutine in place of my fries. I was so hungry at this point so I basically inhaled all of that in a matter of minutes. As you may or may not have guessed I felt pretty terrible afterward as well! So I did the only logical thing and that is go home and go straight to bed with a belly full of junk food! Oddly enough I felt OK the next morning! Speaking of food I have nearly perfected my Orzo Bacon Mac & Cheese Recipe! I’ve only got four words for you, creamy bechamel cheese sauce… and bacon! OK that is five words, but lets face it even the word bacon makes everything better! The cheese sauce is one heck of a workout to make from scratch, but oh so worth it! In fact I might even make another batch this weekend! Yum! That about sums it up other than that it’s mostly the daily grind. There were a few other happening and events along the way, but nothing I will make public. This blogger does have a private life after all! Until next time! This entry was posted in Blogging, Cooking, Food, Health, Hockey, Life, Randomness, Sports, Thoughts and tagged aging, another day older, bechamel sauce, Bell Center, birthday, blogging, cooking, creamy bechamel cheese sauce, fast food, food, getting older, Harveys, hockey, hockey life, life, mac and cheese, Montreal, Montreal Canadiens, my boring life, orzo, orzo bacon mac and cheese, Timbits hockey, while you were away, yummy. Bookmark the permalink.